Hi Sakinah, I would like to speak with you briefly to see if you're a good fit to coach me. Please contact me at your earliest convenience. Sakinah was educated at Henry Ford College where she obtained her Associates Degree in Computer Information Systems in 1999. She has worked as a Flight Attendant, Entrepreneur, and Real Estate Broker. She later obtained a Bachelor’s Degree in Information Technology and Security at Baker College in 2010. 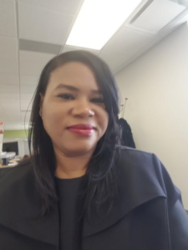 Her passion is learning new things and educational achievement so she continued her educational track by obtaining a Master of Science in Information Assurance in 2012 and Master of Science in Software Management in 2014 from the University of Detroit Mercy. She has coaching training in postive psychology and is an fierce advocate for Science, Technology, Engineering, Art, and Math education for the future generations. Have you worked with Sakinah? Tell your friends! Sakinah doesn't have any reviews yet. Sakinah hasn't submitted any articles.